The morning hour is one of the best times to work in reading aloud into our daily rhythm. Specifically, breakfast time. I have a captive audience upon which to pour out beauty–for my children and for myself to soak in. Starting the day off with something beautiful and purposeful, gently nudges us in a good direction. Even when kids are crabby and upset (TANTRUM), its good to know that we have this block of uninterrupted time to move slowly and work out kinks. Breakfast is a long affair at our house. Not fancy, just slow. The boys set out their dishes, napkin, cups. They pour out their drinks and sit down to wait for their food. Sometimes its just Ezekiel bread right out of the bag with a pat of butter on it. We set things up, we pray and then, we experience beauty! We are never in a hurry to finish. They need time to think and absorb and process. There are days when it takes 7 minutes start to finish and they are racing off to find an activity. But there are also days when little hearts have questions they don’t know how to ask aloud and gentle patience is needed. So I read to draw out their hearts. I read to pour in a piece of truth that will soak down into those soft pink ears to light upon their souls. We are currently reading through several poetry collections. We read one or two poems in the morning as a fun warm up. Oftentimes the kids will beg for more or ask for one long poem to be read out loud again. 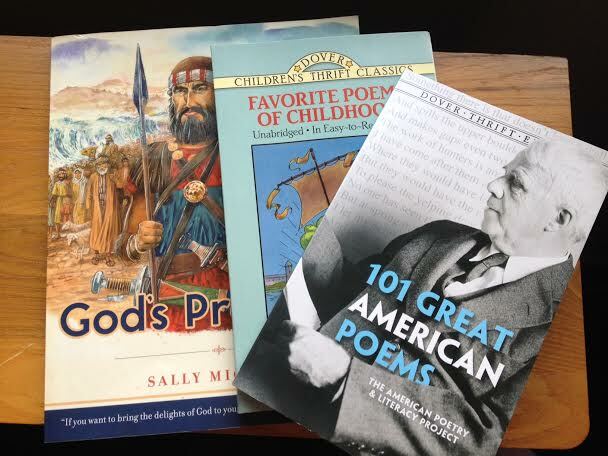 They have surprised me by memorizing several small poems after only a few readings. My boys love the cadence of poems. The certainty of what the next sound will be and the uncertainty of where the poet is taking them—calculated suspense! Poetry is adventure. Next, we will read a lovely story. This book is almost always focused on virtue or character building. 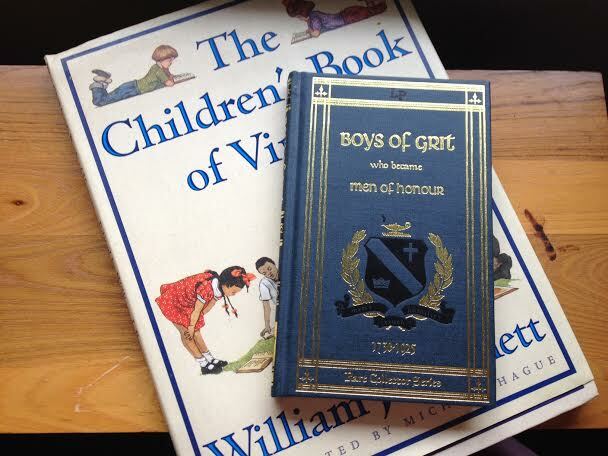 We have read excerpts from biographies, short stories, children’s fiction, and allegories. The qualifications are simple: beauty and truth. Composer study, Artist study, and hymn singing are also treasured parts of the morning. Lastly, we read a brief devotional from a study to close out the breakfast hour. We are currently reading through some devotions by Sally Michaels, who has become a household favorite! (I will include all book links at the end of the post). That has been the routine for many years. But now, we have a pair of second graders ready to read the Scriptures on their own. I want my children to be confident navigating the Word so they can feed themselves from Scripture. I don’t want them to be depending upon me for their sole Scripture reading. Not at this stage in the game. We will still read the Bible as a family, but they must now take up their swords and learn how to wield them on their own. Our four and two year olds will be excused after the short devotional and the two elder children will be studying their own Bibles for 5 minutes. 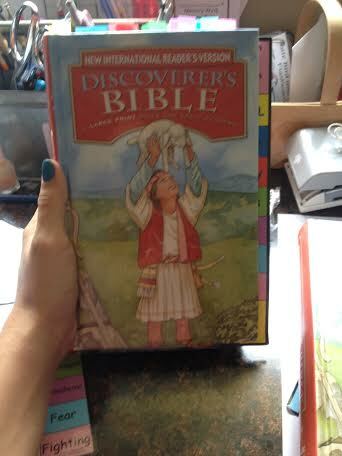 The Discoverer’s Bible is a large print Bible for early readers. We have incorporated the Child Training Bible program to help them in learning to navigate this precious tool. I’ll let you know how things progress as the kids learn to feed themselves from Scripture! Check out Ann Voskamp’s routine: “Listening: a Way of the Spirit” for more inspiration! (Girl counterpart books found here). I LOVE LOVE LOVE your blog! I just found it and I’m SO GLAD I did. It exactly reflects my heart for our homeschool and I am so grateful to have this as a source of encouragement and inspiration. We are using almost all of the same things amazingly!! It’s a little “too bad” (although not really) that we are ahead…we are in our second year of Adventures, but I want to take many of the principles you lay out and apply it in our homeschool! Thank you for sharing. Thank you so much! I have a feeling our time with Adventures will be extended too. So much goodness in there! I hope you all have a blessed and beautiful year finishing up Adventures! I love your blog. My baby is 38 years old now, but as I look forward to grandchildren I read your blog with the joy of anticipation. Thank you for taking the time to share your family with us and your obviously God-given talent. May you continue to be blessed. Hello! I love your blog and love your ideas. I plan to incorporate this morning hour with our 4 kids very soon. 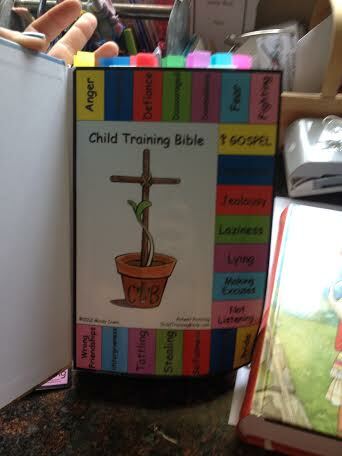 I noticed that the Child Training Bible now has a Virtue Training Bible set. Are you familiar with this? Do you think it would be compatible with the CTB set? I’m new to both so wasn’t sure if you could use both and/or if they would all fit in one Bible. Thx! Hi Angie! No I didn’t know that they had new material. I’ll have to check it out 🙂 Thanks for the head’s up! Thanks for putting my heart into words with this post! I love the book recommendations for the ones I don’t have already! In a recent instagram post you also mentioned you read during lunch, tea time and before bed (as do we! Isn’t it amazing the captive audience you have while they are eating?!). I would love to know your thoughts on choosing your themes for those read aloud times. Keep up the good work mama!! Great question! I’ll put it on the list! May I quote you regarding poetry (my passion these days) on my poetry webpage @aneverydayfaith?